This popular gluten free gift hamper is ideal for coeliacs and those following a gluten free diet, and includes a variety of festive goodies. Our gluten free Christmas hamper, containing 8 foodie treats, makes an ideal gift for coeliacs and those following a gluten free diet. Contents include gluten-free Christmas puddings, gluten-free Christmas biscuits and other seasonal products (subject to availability). We also offer a popular bespoke hamper service for those looking for something a little different or want to create a more meaningful gift for a loved one. 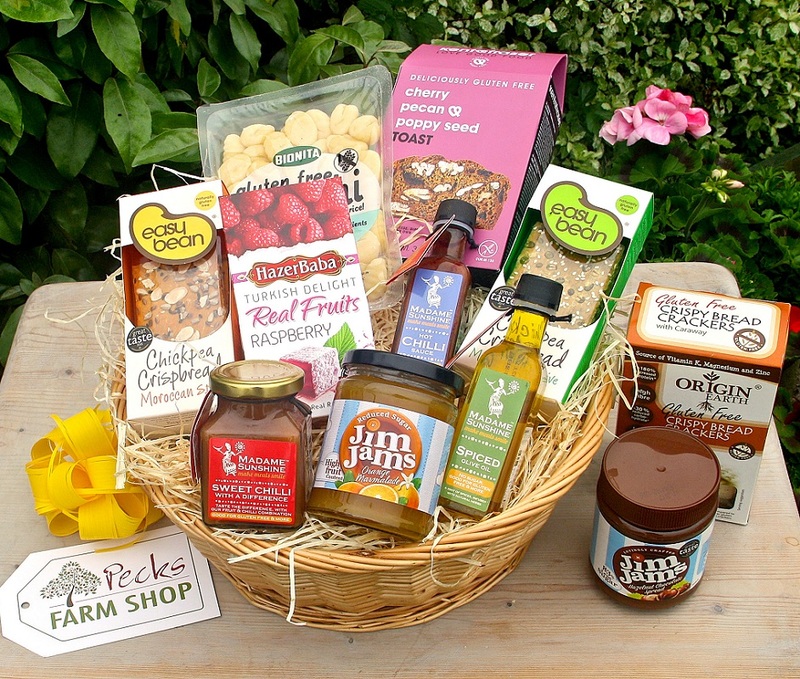 You specify what you would like your gluten free hamper to contain from our extensive range of gluten free products and if you wish which wicker basket you’d like used. This unique service gives you total flexibility to create your own customised gift hamper. We can either deliver on your behalf to Mainland UK, see delivery information, or you can collect from the Farm Shop which is located between Milton Keynes and Leighton Buzzard in Bedfordshire. In addition, we include an attractive handwritten greeting tag to accompany this hamper. Please note if we are out of stock on an item, we will substitute it for an item of a similar product of equal or greater value. You will only be charged the lower price. If you do not wish to have a substitute please do say when ordering.